I started Mariah's sleeve today. I'm taking the idea from everyone and swatching by starting a sleeve. 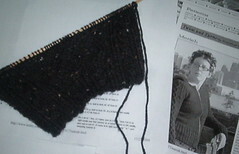 So far it's really a fun knit. I'm enjoying using a chart. It definitely helps me keep my place. 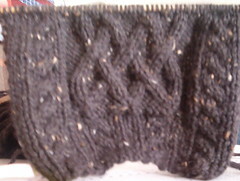 The black is hard to photograph. But I think you get the idea. 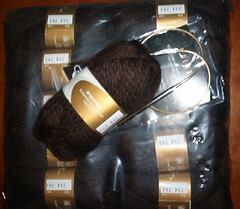 :) I also got my Chococolate Truffle Wool today and is it yummy!! Can't wait to start Banff! After a bunch of things of course! :) Well, not much else! Write more soon!